ww2dbaseCommissioned in Aug 1944 with Lieutenant Commander Paul C. Stimson in command, USS Sea Robin held her shakedown cruise off New Hampshire and Connecticut, United States then headed for the Pacific Ocean in Oct 1944. Off the Panama Canal, she was mistaken for a German submarine and was fired upon by a merchant ship; she escaped without damage. On her first war patrol in the Luzon Strait between the Philippine Islands and Taiwan, she sank the Japanese tanker Tarakan Maru. Her second war patrol was her most successful one, sinking three cargo ships and a gunboat off Java in the Dutch East Indies and sinking two fishing vessels in the South China Sea. During her third war patrol, her bow was damaged during an air attack, leading to failed torpedo attacks later in the third patrol, but the problem was not discovered until later. She arrived at Midway Atoll for replenishing in mid-Aug 1945, where she would be when the Pacific War ended. ww2dbaseIn the immediate years after the war, USS Sea Robin was based in the Panama Canal Zone. In mid-1947, she became the first American submarine to round Cape Horn as she circumnavigated South America during a simulated war patrol. In early 1949, she was overhauled at the Philadelphia Naval Shipyard, Pennsylvania, United States. In 1949, her base of operations was switched to New London, Connecticut, United States. Between Sep and Nov 1950, she served in the Mediterranean Sea with the US Navy 6th Fleet. In 1951, she was converted to a GUPPY IA submarine. In the 1950s and 1960s, she served out of New London, Connecticut, United States and in the Mediterranean Sea (with the US Navy 6th Fleet), participating in several exercises and training cruises. She was decommissioned in Oct 1970 and was sold for scrap in the following year. 1 Mar 1944 The keel of submarine Sea Robin was laid down. 25 May 1944 Submarine Sea Robin was launched, sponsored by the wife of US Navy Captain Homer Ambrose, the production superintendent at the Portsmouth Navy Yard in Kittery, Maine, United States where the submarine was built. 7 Aug 1944 USS Sea Robin was commissioned into service with Lieutenant Commander Paul Stimson in command. 6 Jan 1945 USS Sea Robin sank the Japanese tanker Tarakan Maru in the Luzon Strait, hitting her with 2 of 3 torpedoes fired. She also fired another 9 torpedoes at a destroyer and another tanker, but none of them struck their targets. 29 Jan 1945 USS Sea Robin arrived at Fremantle, Australia, ending her first war patrol. 3 Mar 1945 USS Sea Robin sank the Japanese cargo ship Suiten Maru north of Surabaja, Java, hitting her with 1 of 7 torpedoes fired; she picked up 3 survivors. 5 Mar 1945 USS Sea Robin tracked an escorted convoy of two cargo ships through out the day; she sank gunboat Manyo Maru with three of three torpedoes fired, cargo ship Shoyu Maru with one of three torpedoes fired, and cargo ship Nagaru Maru with one of seven torpedoes fired. Sea Robin was hunted by Japanese ships and aircraft after the attack but was able to escape. 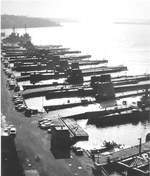 15 Mar 1945 USS Sea Robin arrived at Subic Bay, Philippine Islands and took on supplies. 19 Mar 1945 USS Sea Robin departed Subic Bay, Philippine Islands, continuing her second war patrol. 23 Mar 1945 USS Sea Robin rescued a downed American airman in the South China Sea. 30 Mar 1945 USS Sea Robin detected a group of six Japanese destroyers in the South China Sea just off Hainan, China. She fired 3 and then 6 torpedoes, but all 9 torpedoes missed. She survived 20 minutes of depth charging after the attack. 8 Apr 1945 USS Sea Robin sank two small Japanese fishing vessels in the South China Sea with her deck gun and took on 3 survivors. 9 Apr 1945 USS Sea Robin took on 10 survivors of a sinking Japanese trawler damaged by Allied aircraft in the South China Sea. 29 Apr 1945 USS Sea Robin arrived at Pearl Harbor, US Territory of Hawaii, ending her second war patrol. 1 Jun 1945 USS Sea Robin departed Pearl Harbor, US Territory of Hawaii for her third war patrol. 9 Jul 1945 USS Sea Robin sank a small Japanese patrol craft with one torpedo in the East China Sea and took on one survivor. 10 Jul 1945 USS Sea Robin sank Japanese cargo ship Sakishima Maru in the East China Sea, hitting her with all four torpedoes fired. 19 Jul 1945 USS Sea Robin fired eight torpedoes at a Japanese tanker in the East China Sea, but all torpedoes missed. 20 Jul 1945 USS Sea Robin fired a torpedo at a Japanese ship in the East China Sea; the torpedo missed. 21 Jul 1945 USS Sea Robin fired a torpedo at a Japanese patrol boat in the East China Sea; the torpedo missed. Later in the same day, she sank two small tankers with her deck gun. 22 Jul 1945 USS Sea Robin sank a small Japanese vessel with her deck gun in the East China Sea. 23 Jul 1945 USS Sea Robin sank a small Japanese vessel with her deck gun in the East China Sea. 24 Jul 1945 USS Sea Robin fired three torpedoes at a Japanese oiler in the East China Sea; all torpedoes missed. 24 Sep 1945 USS Sea Robin arrived at Galveston, Texas, United States. 15 May 1947 USS Sea Robin commenced a simulated war patrol which called for her to circumnavigate South America; she would become the first American submarine to round Cape Horn. 20 Aug 1949 USS Sea Robin arrived at New London, Connecticut, United States and joined Submarine Squadron 8. 23 Feb 1950 USS Sea Robin departed New London, Connecticut, United States for Exercise Portex. 23 Mar 1950 USS Sea Robin arrived at New London, Connecticut, United States. 30 Aug 1954 USS Sea Robin departed for a six-week training cruise in the Arctic Circle. 4 Jan 1955 USS Sea Robin departed for the exercise Operation Springboard in the Caribbean Sea. 24 Jul 1957 USS Sea Robin entered Portsmouth Naval Shipyard, Kittery, Maine, United States for a scheduled overhaul. 28 Mar 1958 USS Sea Robin departed New London, Connecticut, United States for the Mediterranean Sea. 22 May 1967 USS Sea Robin departed for a two-month tour of Northern Europe with other submarines. 2 Oct 1967 USS Sea Robin entered Philadelphia Navy Yard, Pennsylvania, United States for a scheduled overhaul. 1 Feb 1968 USS Sea Robin completed a scheduled overhaul at Philadelphia Navy Yard, Pennsylvania, United States. 1 Dec 1969 USS Sea Robin was transferred to Submarine Squadron 2 based in New London, Connecticut, United States. 4 Aug 1970 USS Sea Robin made her 12,920th and final dive. 1 Oct 1970 USS Sea Robin was decommissioned from service and was struck from the US Naval Register. 3 Jun 1971 Submarine Sea Robin was sold to North American Smelting Company, Wilmington, Delaware, United States for scrap.